Honest answer? I’d really love some more time in my day. I’m sure all you moms and dads out there can relate. We’re used to things being hard and taking twice as long as they should. If you don’t know what I mean, just try getting my kids out the door with their jacket and shoes on sometime. You’ll never get those 20 minutes back. So what are you to do if marketing to moms is on your priority list and you need to reach this time-starved audience who doesn’t have the time or energy to pay attention to you? Lately I’ve been hearing from multiple mom friends that Facebook “really gets” me. Curated fashion in a box, home décor for every decorating style, a curling iron that gives you perfect waves in minutes, and organic gluten-free meal kits (so many meal kits…) are popping up in our newsfeeds and finding their way to our doorsteps one carefully planned, multi-channel campaign at a time. They’re working because these items are hitting the exact right audience at just the right time, clearly explaining their benefits all in 300 x 250 (-ish) pixels. A couple clicks later, a shipment is on the way. But of course it takes hard work to create an experience that seamless, and the display ad itself usually isn’t the whole story. I have a go-to online retailer for kids’ shoes. They ‘get’ me. Recently, they hit me with a direct mail piece reminding me that I had unused rewards to spend. Awesome! I promptly filed this in a pile of stuff I’ll never look at again without a reminder. However, a few days later I received an email from them. Since it was top of mind that I had rewards to spend, I took a look. Coincidentally (or not), their new summer styles had just hit the website and there was also a half-off promotion on clearance shoes. I didn’t have time to shop that very moment, but good to know. That evening, the kids were put to bed, and I was on the couch scrolling through my social media feeds. There staring back at me was an ad reminding me that time was running out on the half-off sale. Well now I better take a look ASAP. I logged onto the website where I’ve come to rely on slick search functionality that lets me filter by only those pairs eligible for the sale as well as the size and style I’m looking for with just three clicks. And when checking out, I didn’t have to dig up the direct mail piece to enter my rewards code – it was already right there in my cart. Pure genius! Four pairs of shoes later (that I’m SURE were all a great deal), I’m basking in all my free-shipping glory. So imagine my feelings of betrayal when the package arrives and I realize they’ve sent me an incorrect pair. I think, “Here we go; I’ll have to spend forever on the phone with customer service getting this resolved. I should’ve known nothing could ever be this easy.” But thankfully they came through for me once more and the friendly representative fixed everything in less than 5 minutes. I felt equal amounts of shock and gratitude. They just reinforced why they are my go-to shoe retailer, and my brand love for them is through the roof. As a marketer, I have a special level of respect for experiences like this. An insightful marketing team decided to synchronize the direct mail rewards campaign with the Spring clearance email so that busy moms like me would be primed to pay closer attention to the promotion. Then a display-ad campaign triggered to their list resulted in a series of touchpoints that built upon one another. As this story unfolded in front of me, relevance and urgency increased with each communication until I could no longer ignore it. Finally, they backed it up with an amazing customer service experience. So in a way, this shoe store actually made good on my Mother’s Day wish by saving me time and making me feel appreciated as a valued customer in the process. The bottom line is that when a brand ‘gets’ me, and gives me what I need quickly and easily, I don’t mind that I’m being advertised to – as a mom, I’ll take the help where I can get it. As a marketer, it’s a good reminder that when we provide smart, integrated advertising directed at the right audience, we can do more than just drive a purchase. We can create a memorable experience and build long-term loyalty. 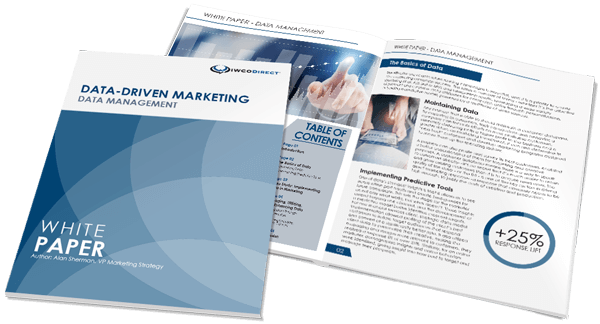 Alan Sherman wrote a great article on Wednesday on how to bridge direct mail with digital and display advertising to reach your customers through multiple touchpoints. Whether you’re interested in marketing to moms, marketing to motorcycle enthusiasts, or nearly any other group of like-minded people, IWCO Direct creates synchronized multi-channel campaigns like this for our clients all the time. If you would like to know more, please let me know. And Happy Mother’s Day!